Sugar is one of the most exciting mediums there is for food crafting. The structure of it allows glass like manipulation to create amazing sculptural pieces. I first became interested in working with sugar when a good friend of mine was going to school to study pastry and sugar art. Learning about 飴細工 (amezaiku) which is Japanese lollipop art only solidified that interest. The Art of the Confectioner- Sugarwork and Pastillage is meant for professional candy and pastry makers, but it also break the techniques down enough to be followed by the serious home cook who wants to try something new and exciting. There are recipes for each technique, as well as lots of photographs to explain the steps. The book starts with the basic tools you'll need. However some tools are specific to techniques, so also look at the technique you want to see the tools you'll need for that project. Pastillage- this is something like a sugar clay that can be worked much like polymer clays, it's allowed to air dry and can be airbrushed with food safe colors. It can be rolled and sculpted. Pastillage is white. Sugar casting works to create solid transparent pieces. It's similar to any hard candy you may have made. There are also newer effects like net which creates lacy patterns in a sheet and pressed sugar which is the same way sugar eggs or sugar skulls are made. Each technique has projects shown with step-by-step instructions. You will learn how to make molds for casting, how to texture pastillage, and how to blow shapes like doves for an incredibly lovely cake topper. There are also tips for painting the finished pieces. While some of the ingredients will have to be purchased online or at a specialty store, it's worth it. There are lots of photographs which show the range of this medium. Fish swimming in coral, abstract works of art that look like glass and ornaments that look like vintage German glass. 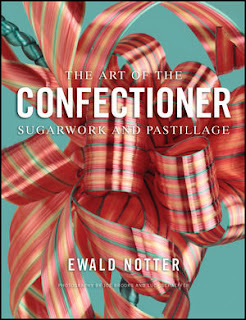 I really recommend it, and think that sugar sculpting may be a micro-trend soon in food crafting. This book is over 300 pages of well written and photographed instructions, recipes and tips. It's a comprehensive course in itself. The book introduces a lot of techniques to improve baking skills. It's interesting to employ all of them and be able to have more people love them.